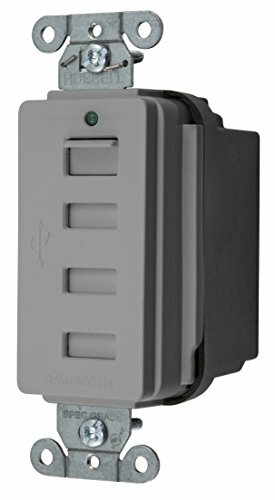 Bryant's USB 4 Port Charger Outlet features a USB port door, which when open enables power. When closed, all power is switched off. This eliminates all current flow for a "zero" no-load. The USB outlet is a permanent solution for device charging, compatible with all USB powered portable devices. This means no more misplaced chargers or dealing with outlet clutter. The Bryant USB outlet is designed to last. Its current transformer converts AC power to DC, providing clean, stable power, low heat and longevity. Plug-in cubes and adapters tend to have a short product life, making the USB outlet the economical choice. Questions, call Bryant Tech Support at 475-882-4820.